It’s less than two hours before the start of Game 5 of the World Series, and I’m standing outside Wrigley Field waiting on a miracle. Now, I knew the odds of me getting into the ballpark were slim to none. Then again, so were the odds of the Cubs coming back from being down 3-1 in the series. I figured I’d hang out a while and soak in the scenery before heading home or to a bar to watch the game on TV. 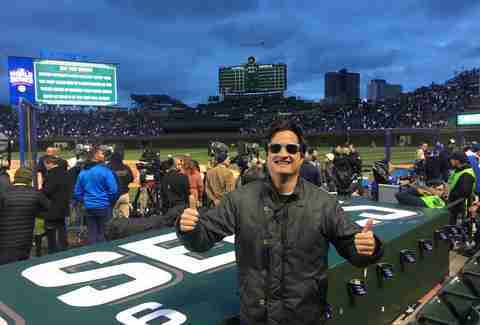 I’m taking in the vibes of the first World Series at Wrigley in decades when, all of a sudden, a friend who I haven’t seen in over a decade walks up and hands me a standing room ticket. He’s in town visiting from Colorado, telling me he’d rather give me his extra ticket than scalp it. I don't ask any questions. Boom. Magic. I’m inside the stadium, giddy as a school kid, and head up near the field to snap a pic. Once the game starts, I squat with my buddy in the upper deck for a while until people show up to claim their seats and then I spend the rest of the game bouncing around the stadium, meeting people from all over the world equally giddy with anticipation. Yet as any Cubs fan knows, excitement is always tinged with a heavy dose of dread. 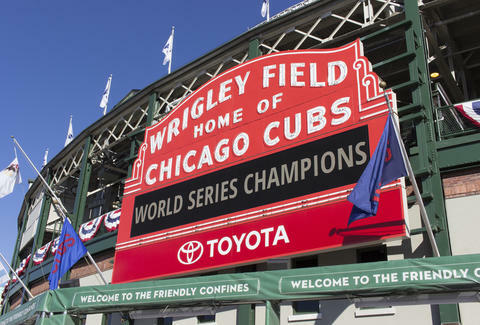 And in this case, the Cubs had already lost the first two games at Wrigley thanks to some anemic batting, a trend that continues through the first three innings of Game 5. Like most fans, I was born into this. I had no choice. One of my earliest memories is watching the games with my grandpa whose screams of agony at the TV made up my formative experiences with the club. I’m in line for drinks on the Jack Daniel's patio when I hear it: an eruption from the crowd, as Kris Bryant has just gone yard to tie the game, 1-1. Next thing I know I’m jumping up and down, high-fiving a dude in a Santa suit. That’s when I get another feeling: The Cubs' bats are about to come alive. We win the game; as we leave the stadium a row of cops about 100 officers deep are on the receiving end of even more high fives. Like most fans, I was born into this. I had no choice. One of my earliest memories is watching the games with my grandpa, a diehard fan who never lived long enough to see these 2016 Cubs but whose screams of agony at the TV (usually directed at error-prone players like Shawon Dunston) made up my formative experiences with the club. This year was for him, and all of those like him. I remember ’84 (mostly because of the jerseys), when they blew a 2-0 series lead against the Padres in the NLCS. I remember 2003, with my buddy screaming “the Cubs are going to the World Series!” as we watched from a bar five outs away. The next play was the Bartman play, and my brother still hasn’t forgiven my friend for his premature celebration. You see to Cubs fans, there’s always some mystical element at play, some excuse to make sense of the ignominious outcome besides just 108 years of bad luck and even worse baseball. This year we're largely freed from that panic, thanks in large part to Maddon and the team’s relentlessly upbeat outlook, but that doesn’t mean we aren't still pushed to the brink at the end of Game 7. THE CUBS WIN THE WORLD SERIES. (Even now, it feels strange to type.) 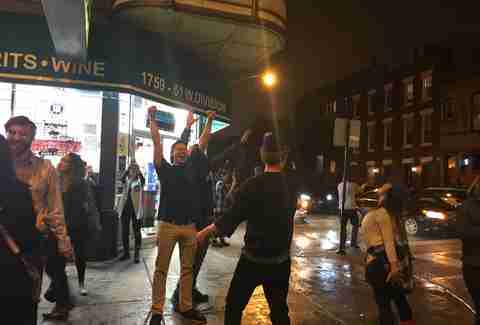 We bust out of our apartment and race towards Division St, where we’ve high-fiving cops and passing cars, hugging crying strangers, dancing in the street, and taking part in Champagne showers outside the local liquor store as the crowd is sprayed in a glorious celebration. The energy is electric, but fleeing. We keep roaming down the street, screaming, and high-fiving at least 100 people, trying to hold onto the feeling for as long as possible. 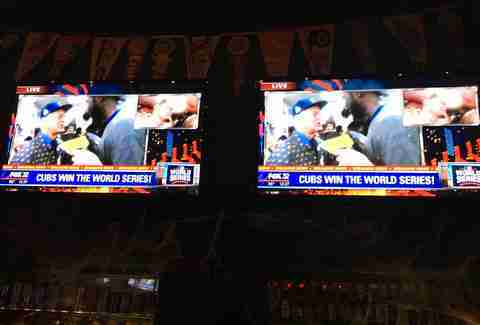 We duck into neighborhood sports bar Anthem, where the energy is waning, we scream “Cubs” and watch it pick back up before it dips back down to Earth. We take as many photos as possible, including one of the TV that is declaring the news that the Cubs have won the World Series, never wanting the feeling to end. But eventually the bars close and we walk home, the street largely silent except for a few celebratory horns still blaring off in the distance. The next day I wake up laughing, still not sure how to process the magnitude of what just happened. 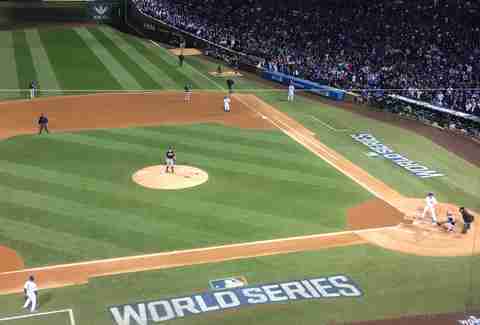 Something that, as Cubs fans, we had been conditioned to think would never happen had just happened. Everything seemed different that day, there was finally justice in the world. If the Cubs can win the World Series, anything was possible. For Parade Day there's more magic in the form of a picture-perfect sunny day more fitted for Southern California than November in Chicago. A ticker-tape parade down packed city streets with smiling players on double-decker buses bearing the phrase “World Series Champions.” I finagle my way into Grant Park and am there to witness history, soaking up every last bit of atmosphere and celebration, getting teary-eyed along with Anthony Rizzo as he introduces David Ross and singing “Go Cubs Go” in a sea of wild-eyed fans. I even manage to get my screaming mug on the local news for a brief cheer. A week later, my voice is still hoarse. I leave the rally and realize the official part of the celebration is over. 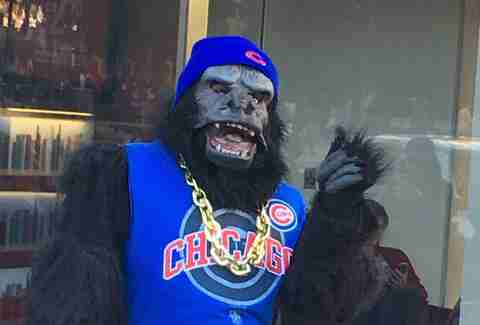 I’m still high-fiving people, laughing at a dude dancing down Michigan Ave in a full Cubby-clad gorilla costume(? 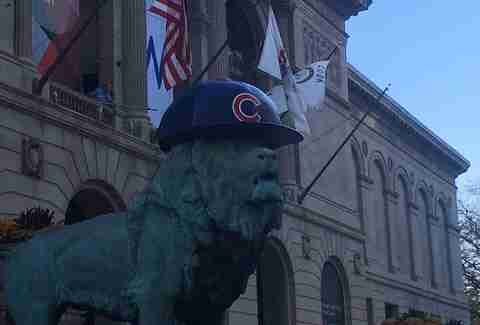 ), and taking pics of the Cubs helmets on the Art Institute lions. We all know the party is winding down, but no one wants to admit it. Eventually the initial aura of amazement and revelry is replaced with a deep-seated feeling of accomplishment, confidence, and quiet contentment. Breathing a huge collective sigh of relief, the city needed this cathartic experience as much as we did. I’ve been to other championship celebrations before, but nothing comes close to this. I remember partying in the streets when the Hawks won the first of their recent Stanley Cups in 2010, I remember the Bulls wins from ‘90s, I remember (barely) the ’85 Bears (mostly for the “Super Bowl Shuffle"). But nothing could have prepared me for this. The Cubs won the World Series. And I believe in magic again.